Back in March, quasi-controversial Pastor Rob Bell released a fully-controversial book titled Love Wins. In it, Bell asked questions pertaining to heaven, hell, and the fate of everyone who ever lived. Thanks to a couple blogs and tweets before the book was even released, a maelstrom of words commenced, causing quite the stir. 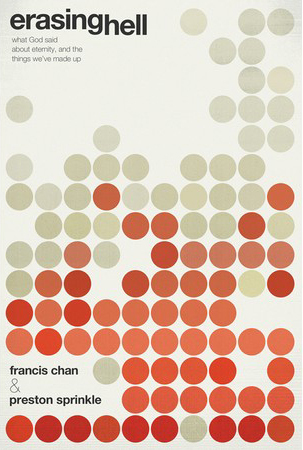 Today, another book is released by a much less controversial Pastor Francis Chan titled Erasing Hell. In this 9 minute promo video Chan references recent interest in hell, and pleads for people to differentiate between “what God said about eternity and the things we made up.” While not specifically calling out Love Wins, one can’t help but make the connection. And so, in this current climate of conversation swirling around the topic of hell, one might be curious to think what the gatekeeper of hell himself might be thinking. Fortunately, our curiosity will not be left out in the cold. Jumping on the hell-bandwagon is the tour guide himself, Lucifer. Having just finished his latest book, Erasing Love: Hell Wins, the Ol’ Devil seeks to capitalize on people’s current interest in all things pertaining to his homeland. I got the privilege this week of sitting down with the Ancient Deceiver to ask him some questions about his upcoming release. A modified transcript is below. Me: Lucifer, thanks for taking some time in your busy schedule to sit down with me and discuss your upcoming book, Erasing Love: Hell Wins. Lucifer: My pleasure. I have a soft spot for the online world, and blogs have been of particular interest to me. In fact, back in April I released Devil’s Ink, a collection of some of my most recent blog entries. Me: So if you just released a book three months ago, why Erasing Love now? Are you worried about over-saturating the market? Lucifer: No, no… Not at all. I’ve found there are always people out there interested in what I’m doing. Besides, I would be a bloody-fool (Ed note: I was surprised Lucifer had a British accent. Or was I…) to miss this incredible opportunity. Lucifer: People right now are desperate to hear about my home. They want to know if it is real. They want to know what it’s like. They’re interested in whether it will last forever or not. People are hearing all sorts of different ideas that are new to them, and most of them just want to be reassured that what they’ve always thought was true is in fact still true. Others are relieved to hear there might be alternative ways to think about my home. It really is a fabulous time in history for me. Me: Are you referring to Bell’s Love Wins and Chan’s Erasing Hell? Which, I’ll note, are strikingly similar to your own title. Are you worried about taking heat for your lack of creativity? Lucifer: First off, I’m never worried about taking heat. That’s a silly question. And secondly, I’ve often been accused of not being able to “create anything on my own.” People have long enjoyed mocking me for being one who has to borrow (and in their minds, distort) that which is already created. I can’t ultimately say they are untrue in these regards, but I always say the essence of creativity is knowing what’s good enough to copy. Me: So you thought Love Wins and Erasing Hell were good, then? Lucifer: Don’t be ridiculous. Of course they are not good. They’re both garbage and full of lies. My point is, they built up incredible momentum regarding my hometown, and I’d be a fool to not capitalize on that. Me: So tell me what Erasing Love: Hell Wins is about? Lucifer: The basic premise of the book is this: if I can succeed in removing that vile thing called “love” from the day to day reality of people’s lives, then I win. If I can erase love, then the realities of hate, envy, revenge and pride will emerge. And those are my bread and butter. I win in those moments when love is absent. I win when love does not. Me: That sounds rather passive for you. Rather than try to infect or infuse the world with hate and vengeance, unforgiveness and betrayal, you want to just erase something? Lucifer: I learned long ago that you cannot manufacture darkness. Darkness is, unfortunately, only a result of the absent of light. I can’t make darkness. It just doesn’t work (believe me, I’ve tried). But what I can do is remove light. And when I remove light, darkness naturally emerges. So in this book I discuss the strategies of removing love. Where people pursue peace I want to make it feel impossible so that they give up… love is erased. Where people start to have forgiveness rise in their hearts I remind them of how they were hurt and how good bitterness feels… love is erased. When people start to work for justice I put obstacles in their way or tempt them to use their money on things for themselves… love is erased. It’s brilliant, really… and quite simple. Me: What concerns you most? What bothers you to the point where you’d write this book? Lucifer: Well first, I fear nothing. (Ed note: at this point I remind myself this guy is the Father of Lies. There’s no way I believe this one). But if you were to force me to share something, I would probably say that if Followers of the Enemy actually believed what he said about them, then I am in a whole lot of trouble. Lucifer: You Followers really are dense, aren’t you? Your King (Ed note: he more spit this word out than he did say it) told you that the world would know you were Followers if you “loved one another.” And I just can’t have that. If you all start doing that, I’m toast. Me: I thought heat wasn’t a problem for you. Lucifer: Don’t interrupt me! If you and the rest of your kind stop drawing lines in the sand, stop taking sides and dividing, stop picking one personality to follow and demonizing all others (although I do like this behavior), if you start to actually love one another and seek harmony with the other Followers, then my game is up. I lose. People will start to see me for who I am, and as much as I love myself I can’t ultimately see that as a good thing. I need you to fight and argue. I need you to call people heretics and take sides. I need you to write nasty things on your blogs behind a veil of anonymity. I need you to pick the smallest issues and decide you MUST agree on them. I need to win, and in order to that, I need to erase love! Me: Well, Lucifer, I’d like to thank you again for your time. Any last thoughts before we wrap this up? Lucifer: Let me add this. I am fully aware that your Book seems to think that in the end I lose. That in the end I get tossed in to some Lake of Fire (as though that should scare me?). Be that as it may, I intend to damage as much of the Enemy’s goods while I can. I may not win the war, but I bloody well mean to win as many battles as I can. And I win every time love loses. I win every time no one defends the widows and the orphans. I win every time a husband breaks his vow to love, cherish and respect his wife till death parts them. I win every time a person’s name is slandered behind their back and no one stands up for them. I win every time violence is used in pursuit of power, or revenge, or even peace. So just know this, if Love gets Erased, Hell Wins, I win, every time. Me: For once, I think I believe you. Look for Erasing Love: Hell Wins to be released in early fall, 2011.